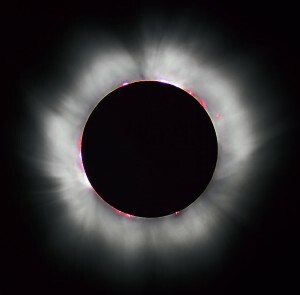 A solar eclipse occurs when the Moon passes between the Earth and the Sun – a rare occurrence. Don’t miss your chance to watch celestial mechanics in action, on 20th March 2015, from 08:30 to 10:44. Observers across the UK will be able to watch as the Moon’s orbit passes in front of the Sun. The transit of the Moon across the Sun will begin at 8:30am. As the eclipse reaches its maximum (90%) coverage at 9:35am, the sky will darken and the temperature will drop. Although there will be more partial eclipses in the coming years, the next total eclipse viewable from the UK won’t happen until 2090. So there’s no excuse not to download our eclipse viewer (see below) and head outside on the 20th March to watch the eclipse as it happens. The video (below) from SciShow Kids is a great introduction for young children on the mechanics of the solar eclipse. Looking directly at the Sun is a really, really bad idea, even during an eclipse. Please observe the eclipse safely. Print this out onto thick card, and follow the directions upon it to view the eclipse safely. A self-contained presentation with the diagrams from this page along with presentation notes. A word of warning: the viewing times in the PowerPoint and viewing card are Newcastle upon Tyne specific. You will need to adjust the PowerPoint if you are elsewhere in the UK. The Time and Date website will help you calculate the correct eclipse time for your location. When we draw pictures of the Moon’s orbit around the Earth, and their orbit around the Sun, we tend to draw them flat – like the diagram below. Looking at that, you’d think the Moon would pass in front of the Sun every month. It doesn’t, because the diagram is over-simplified. In reality, the Moon’s orbit around the Earth and the Earth’s around the Sun are inclined relative to each other by about 5°. The points where the two orbital planes meet are called lunar nodes, and solar eclipses only happen when a new Moon occurs near a lunar node. There’s one other feature of the Solar System that makes solar eclipses possible: the Sun is 400x further from the Earth than the Moon, but it’s also 400x larger. So to us, standing on Earth, they appear to be the same size in the sky. This is a staggering coincidence, and we get to enjoy the spectacle of an eclipse only because of that accident of geometry. Solar eclipses are regular and predictable, but because everything has to be in the right place simultaneously they’re also very rare. Experiencing one is astonishing. The diagram shows how different parts of the planet experience a solar eclipse. The small area in the centre, in the track of the moon’s shadow across the Earth, is called the umbra. That’s where we experience a total solar eclipse. The more extended region to either side is called the penumbra: there, you’ll experience a partial solar eclipse. So on 20th March, Newcastle is in the penumbra. 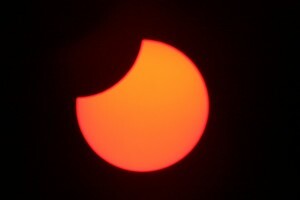 “Partial solar eclipse Oct 23 2014 Minneapolis 5-36pm Ruen1” by Tomruen – Own work. In the penumbra. You’re much more likely to see a partial eclipse than a total eclipse. “Solar eclipse 1999 4 NR” by I, Luc Viatour. In the umbra. The pattern around the Moon’s disc is the Sun’s corona, which you normally can’t see as the Sun’s disc is too dazzling. “Annular Eclipse. Taken from Middlegate, Nevada on May 20, 2012” by Smrgeog – Own work. Remember that an eclipse works because the Sun and Moon appear to be the same size in the sky. Sometimes the geometry works out so that’s not quite the case, and the Moon appears just a little too small to cover the Sun’s disc. 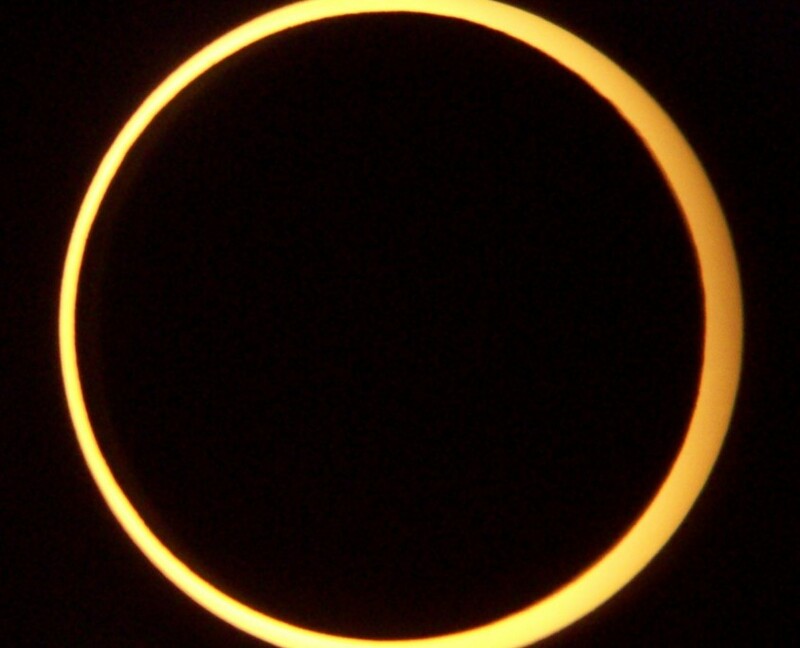 Then, you see a dazzling annular eclipse. Want more eclipse information? We’ve got you covered. 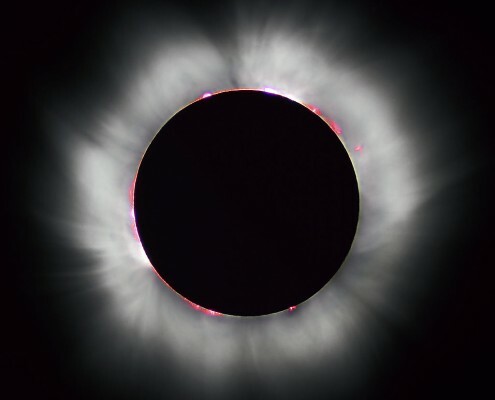 BBC Stargazing Live will be showing the eclipse from 9am on BBC 1.